Great shot! Never seen anything like this. Congrats! Very well deserved - excellent photo!! Congrats on your finalist award. 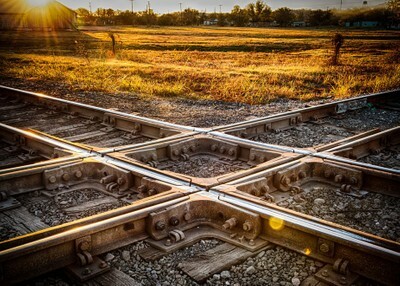 Outstanding creative capture ... Is this called "The Diamond", where tracks intersect like this? ... Congrats on your awards, well done. Me thinks this more creative than the drone shot that won. Nicely done. This photo was taken while walking along the tracks just outside of Taylor, TX. I took this photo just after sunrise. I had been walking around the outskirts of town for about 30 minutes when I came upon this spot. I used natural lighting when exposing the shot. This was taken with a Nikon D700 handheld with no flash. The crossing of the two rail lines in relation to the rising sun really caught my eye. The photo is a 3 exposure HDR composite using Photomatrix Pro. I also used photoshop to kick up the lighting. You have to get out of bed early. Sometimes you'll find a shot, but lighting is not right. Your chances of good lighting are better in the mornings and in Texas, it's cooler in the mornings as well. The best photos I have taken usually occur when it is quiet. Walking for me helps me to clear my mind and also allows my eye to find diamonds in the rough that I would otherwise be too distracted to see.